The official launch of the Confucius Classroom Hub at Scottish Opera was marked by the presentation of a commemorative plaque by Chinese Consul General Pan Xinchun to Alex Reedijk and Peter Lawson, General Director and Chairman respectively of Scottish Opera, at a ceremony held at Jordanhill School on Friday 16th February. 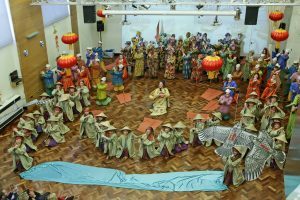 This was followed by a special performance of the Company’s primary school tour production, The Dragon of the Western Sea, involving 99 pupils from Primary 5 and 6. The school congratulates Scottish Opera on joining the family of Confucius Classrooms as the world’s first specialist Hub.